Want to make your number in December? 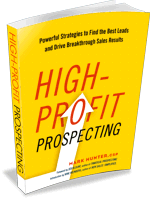 It depends all on your sales prospecting NOW! You have to be prospecting now, and be sure the prospects are truly prospects and not “suspects.” Quantity in your sales pipeline doesn’t matter nearly as much as quality. Making (and exceeding) your number in December will be exponentially easier if you prospect NOW. PrevPreviousExecutive Sales Leader Briefing: Leaders Need a Big EGO!